The simulator allows players to hit a ball at a large video screen, which has images from courses around the world. It was described as an upgrade of a more modest simulator that had been installed during the Obama administration. A source told the Post that Trump, a golf fanatic who owns several courses and plays often, paid for the system and its installation himself, and that he has not yet used it. Other details about the simulator were not available, but the Post noted that three of Trump's 16 golf courses have simulators made by the Danish company TrackMan Golf, and the system costs $49,995. The simulators offer "Hyper-realistic 3D courses mirroring the feeling of being on the real courses," the company's website boasts. The White House already has an outdoor putting green, which was first installed in 1954 by President Dwight Eisenhower. It has other amusements as well, including a movie theater, basketball court and a one-lane bowling alley. 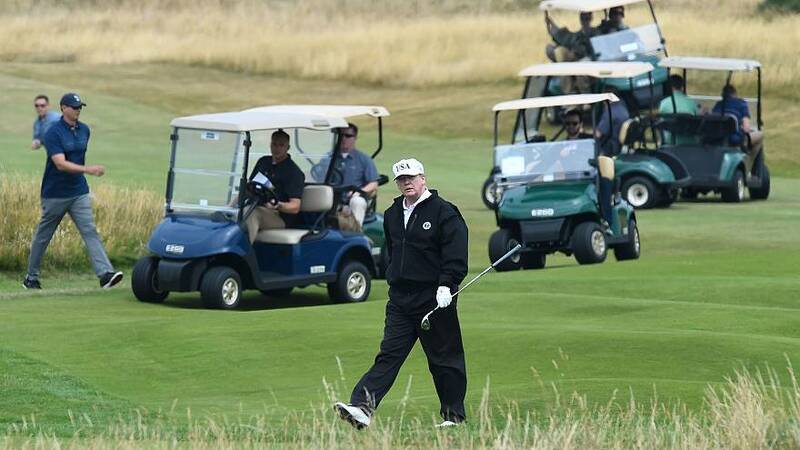 Trump, who complained repeatedly on Twitter about Barack Obama going golfing when he was president, has visited his own golf properties 168 times since taking office, an NBC News analysis found. It's unclear whether he's actually golfed during every visit — the White House generally refuses to acknowledge when he's hitting the links . That likely has to do with his former habit of teeing off on his predecessor during the 2016 campaign. "I'm going to be working for you," Trump told his supporters at one rally. "I'm not going to have time to go play golf." Trump was forced to keep off the greens during the 35-day government shutdown, but went back out on the green with greats Jack Nicklaus and Tiger Woods at his Florida golf course earlier this month.